Personally i think the practical test price needs dropping further, apparently it's going to, time will tell though. 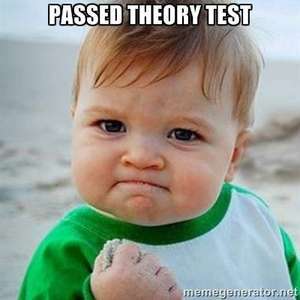 Theory Test was £31 last year, then dropped to £25 and now dropping to £23 from tomorrow. So, in theory it is becoming cheaper to drive a car, though that may not be borne out in practice. hahaha already posted yesterday gooni and you are a mod. tut tut please read the rules ! Good news for the youth of today considering how much they have to fork out for insurance these days. Booked one a few days ago for one of the trainees, as it was for after the 1st the new price was already applied. I can hire a car for 24 hours for £20 from national. ​and they will hire it out / insure it to someone on a provisional? Apps for Android/iOS by Deep River Development I found to be very good. Worth the few quid for the full version and hazard perception practice. Just passed my ADI part 1 using them to practice. That's all you'll need for the theory, hazard perception is the tricky part, don't click to soon because you'll see the hazard long before the computer recognised it. That's all you'll need for the theory, hazard perception is the tricky … That's all you'll need for the theory, hazard perception is the tricky part, don't click to soon because you'll see the hazard long before the computer recognised it. That's all you'll need for the theory, hazard perception is the tricky … That's all you'll need for the theory, hazard perception is the tricky part, don't click to soon because you'll see the hazard long before the computer recognized it. Yes use the online practices and keep at it it's almost impossible to get the clicking at the right time!!! As a driver of 20 years I kept clicking as sopn s I saw the hazard and failed online. just practising with daughter!! Yes, I have a few dashcam videos to prove it. Good news for the youth of today considering how much they have to fork … Good news for the youth of today considering how much they have to fork out for insurance these days. Doesn't need to have the dual controls for test (or even for lessons). You could do it in your own car. I know you can hire dual control cars from Arnold Clark so they obviously insure a non-qualified driver. Would still work out quite expensive though. Hourly rate and bear in mind travelling from hire location to test centre and then back again after test. Not sure about National though. No sure how this is a "deal". DVLA don't do driving tests. DVSA is the organisation responsible for those. Great for those who keep failing and have to go back. Ouch! I take that back! My advice to anyone doing it is do as many online mock tests as you possibly can and there are some free apps available as well. I passed mine first try without purchasing any books or learning software.